Lock in a great price for Lange Jan Hotel – rated 8.7 by recent guests! I come here often. I like the staff the most. Happy and helpful . The hotel is conveniently located at the center of the quaint city. The Comfort double room was quite big. It has a lovely porch. Staff were very helpful. My stay at the hotel/pub was remarkable. I highly recommend it. The receptionist was super friendly, he helped me a lot. Great location. Clean. Cheap. Cool and helpful staff. Super good value with very friendly staff. Our room and toilet facilities were clean. The location is also great. It was a lovely stay. Definitely recommended. Was actually more suitable for a leisure trip but liked it so much. Will come again! 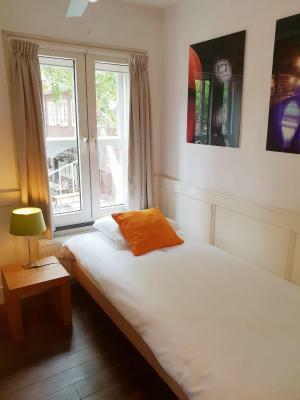 Good bed, good internet, fantastic location, close to restaurants, shops etc. Great location in one of the main squares in Amersfoort. Very convenient place for dinner. The walking tour of Amersfoort is worthwhile (guides available from the tourist office opposite the hotel). Friendly staff. Location - value - in a historic building- super friendly staff. The breakfast was better than expected for this tiny hotel. Lange Jan Hotel This rating is a reflection of how the property compares to the industry standard when it comes to price, facilities and services available. It's based on a self-evaluation by the property. Use this rating to help choose your stay! 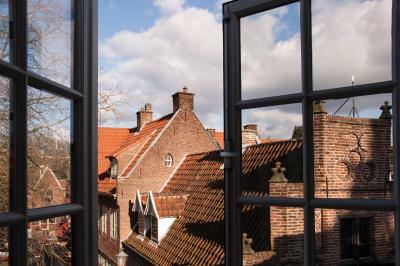 Lange Jan offers unique rooms in a renovated 18th-century building in the historic center of Amersfoort only a 30 minute drive from Utrecht. 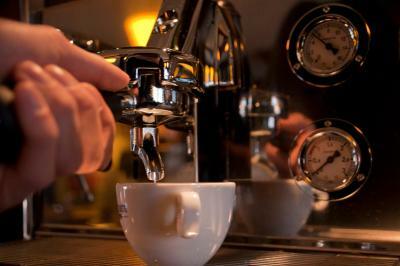 It features a cafe downstairs and free Wi-Fi. 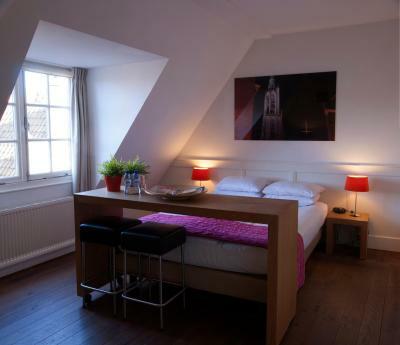 Each of the compact rooms at Lange Jan Hotel has views of the historic quarter and a flat-screen TV. Some of the rooms have shared a bathroom or toilet facilities. The Sint-Joris Church and Museum Flehite are a 5 minute walk from the hotel. Mondrian House is just over 800 feet away. 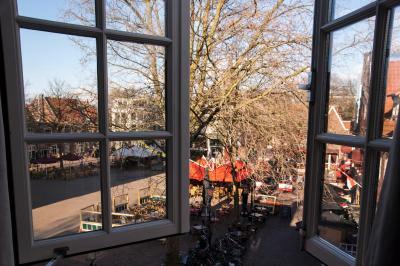 Amersfoort Train Station is a 15 minute walk from Hotel Lange Jan. This property is also rated for the best value in Amersfoort! Guests are getting more for their money when compared to other properties in this city. 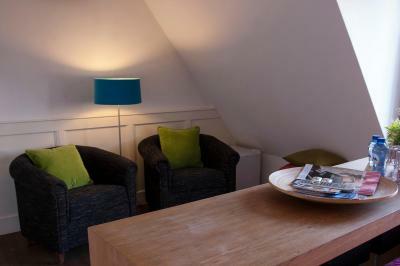 When would you like to stay at Lange Jan Hotel? This room comes with box spring bedding and each room has a different view. It features a hairdryer, refrigerator, heating and flat-screen TV. The bathroom is fitted with a shower or a bath. 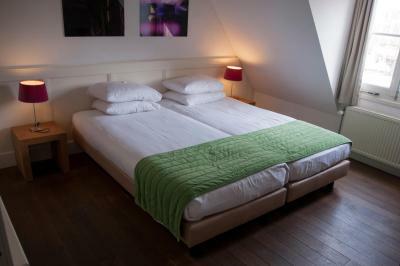 Each room comes with boxspring bedding and a private shower, while the shared toilet is located in the hall. It features a hairdryer, refrigerator, heating and flat-screen TV. Each room comes with a different view and has boxspring bedding. It features a TV, washbasin and heating. The bathroom and toilet are both shared. This room located in a quiet area of the hotel has room for 2 extra beds. It features a flat-screen TV, seating area and bathroom with a bath or shower. House Rules Lange Jan Hotel takes special requests – add in the next step! ATM card Lange Jan Hotel accepts these cards and reserves the right to temporarily hold an amount prior to arrival. Lange Jan Hotel accepts these cards and reserves the right to temporarily hold an amount prior to arrival. Please note that the hotel is difficult to reach by car. 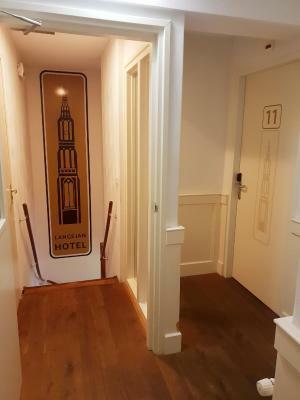 If you wish to drop your luggage, set your GPS to Breestraat 1. Guests are kindly requested to contact the hotel, by telephone using the contact details found on the booking confirmation, if they would like to book an extra bed. Extra beds are always upon request and not guaranteed. Guests can make use of late breakfast and late check-out on Saturday and Sunday for an extra charge. Please contact the hotel for details. Please note that guests will be held responsible for any damages and will be charged a fee as appropriate with a maximum of €350. Very cute hotel in a dynamic square of the city. Although it is upsairs from a pub it is very calm. The common facilities (shower, bathroom) are very clean and available. Breakfast buffet has a good quality and variety (great dutch pancakes, first time I see houmous in a buffet). In any case, the hotel exceeded our expectations. I like nice, quiet, big room with full of light in the center of the city, not far from my business interest. Although the street was noisy, inside the room was silence. The mattress was lumpy. The room was quite cold in the evening. The toilet being in the hallway and super small was slightly inconvenient. - my room had a private shower but the toilet was in the corridor outside and I was aware of this when I booked the room. 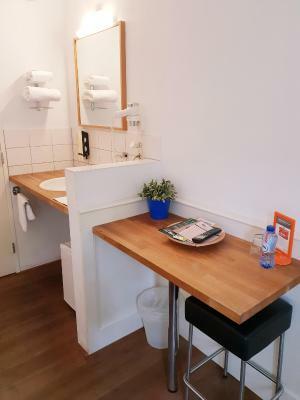 BUT there is only ONE toilet for several rooms - the price was on the high side but hotel prices are high in the Netherlands! De aardige mensen en ligging direct in centrum! At its highest the heating didn't heat. I usually hang work in the room with my laptop. In this room the only thing I could do was to crawl under the blanket. Clean. I love the café downstairs. Great location. It was quiet and clean. The heating. First time I come here on a winter day. The heating at its highest doesn't warm the room at all. You have to undress and get under the room as soon as possible. Our room was directly above the pub's beer garden which was absolutely banging until gone 1am. On a Tuesday night FFS, not even as if it was the weekend! Can't imagine what it's like on a Friday. Lovely friendly staff, attached to a pub which did good food and a great selection of beers. Just what we needed after a long journey. Room was basic but nice and clean. The warm welcome we received. The complimentary water in the room. The complimentary drinks in the bar. The bathrooms were spotless and it was so quiet! a really nice place to stay and have a drink as well. the staff is truly nice and always in for a good one!